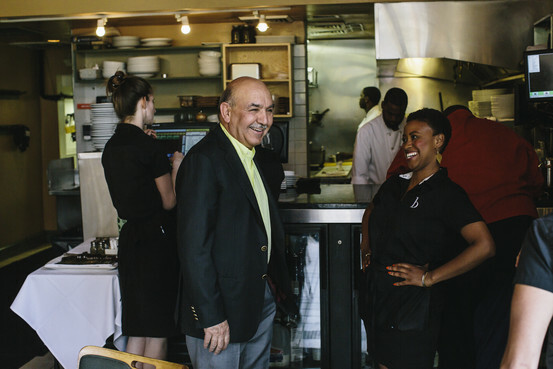 Qayum Karzai, the older brother of Afghanistan's longtime president Hamid Karzai, talks to staff at one of three restaurants he and his family own in Baltimore. BALTIMORE—After ending his presidential campaign in Afghanistan, Qayum Karzai returned here last month to his other life: worrying about the price of striped-bass tapas. Like many Afghan leaders, Mr. Karzai keeps a foot in another world—in his case, a mini restaurant empire in Baltimore. Even while running a campaign half a world away, he weighed in on menu changes, leases and customer complaints. The dual life has long been the norm for the older brother of current President Hamid Karzai. For the past dozen years, he has shuttled between Afghanistan and Maryland. He has served in the Afghan parliament, pushed for Afghan dialogue with moderate Taliban members and informally advised his brother. All the while, he kept a hand in the businesses largely run by his wife, Patricia, son and a trusted associate. "At times, it's very, very difficult," the 66-year-old Mr. Karzai said in a recent interview at the family-owned bistro in Bolton Hill, a neighborhood of elegant brownstones. "It was a sacrifice, but it was a cause, an emotional cause after Afghanistan being in turmoil for 35 years." Mr. Karzai—a green-card holder with Afghan citizenship—had no plans as a young man to go into food service. In 1969, he traveled to the U.S. to learn to fly fighter jets for Afghanistan's air force but said unshakable motion sickness ended that plan. He moved to Washington, D.C., for college, and by the late 1970s, was studying political economy in graduate school. He abandoned his studies after Afghanistan's leftist coup in 1978 brought a number of relatives to the U.S. A year later, the Soviet Union invaded his country. He visited the border regions of Pakistan through the 1980s and '90s, and founded a group called Afghans for Civil Society. Since 2001, he has spent more than six months a year in Afghanistan. In that time, he says, new schools and better roads have improved the lives of many Afghans, though the country is still beset by problems such as rampant corruption and steep unemployment. Mr. Karzai learned the restaurant trade while working his way through college. In 1985, he and a brother opened an Afghan restaurant in Chicago, and four years later he launched the Helmand in Baltimore's historic Mount Vernon district. It was followed by Tapas Teatro, a small-plate eatery that opened north of downtown, and a bistro, simply called b. He is a man who sweats the details. At Tapas Teatro last week, after dropping off printer paper and a potted hydrangea, he bent down to pick a scrap of paper off the floor and saw something on the specials list that concerned him. The $12 striped-bass dish seemed too pricey for tapas (keeping them under $10 will encourage patrons to buy more, he said). He made a note to talk to his 34-year-old son, who runs the restaurant. He has dictated that all customers be greeted within 60 seconds of arriving, a sign of respect, he says, that also works well in politics. Mr. Karzai isn't the only prominent Afghan politician who has spent much of his life in the West. He withdrew from the presidential race in favor of former foreign minister Zalmai Rassoul, who studied medicine in France and lived for decades in Europe. Mr. Rassoul, according to preliminary results from the April 5 election, didn't make it into the runoff, beaten for second place by former World Bank executive Ashraf Ghani. Mr. Ghani has a Ph.D. from Columbia University and lived in Bethesda, Md., before returning to Afghanistan after the ouster of the Taliban regime in 2001. Mr. Karzai said his brother discouraged his candidacy, worried he would be blamed for any possible election fraud. "I didn't agree with his logic," Mr. Karzai said, "but he was the president." With financial support for his campaign gone, Mr. Karzai said he had to bow out. On Saturday, after less than two weeks in the U.S., he is scheduled to fly back to Afghanistan. Officials are expected to announce election results Saturday. He says he could support either of the two current front-runners, who also include former foreign minister Abdullah Abdullah. He is more optimistic about the country than ever, he said, after voters turned out in huge numbers despite Taliban threats of violence. Back in Baltimore, many customers have known of his ties to Afghanistan and membership in a prominent Kandahar province family since the months after the Sept. 11, 2001, terrorist attacks, when Hamid Karzai was elevated to power. David Spector said he and his wife, Cassandra, regularly eat at all three restaurants. He called Mr. Karzai "a good citizen of Baltimore and a fine restaurateur." Last week, the Spectors dined at the bistro, saying hello to Mr. Karzai on their way inside. "I'm so glad you're not president," Dr. Spector said, prompting a smile from the ex-candidate. Still, Mr. Karzai said he is deeply invested in the future of his native country. If the new president asks him to serve in the government, he said, "I will do it." —Yaroslav Trofimov contributed to this article. The Karzai brothers are noting but looters, they have taken Afghanistan back to 18 century. His brother, Hamid Karzai is a failed unsuccessful president, captured this job by fraud at the second term. His family looted most of international donations, not that ,when international forces established military bases specially close to Kandahar,Karzai family came up claim the lands belong to them and asking for rent and got each months over 100 thousands dollars from each base and put to the their own pockets. Now Karzai family is billionaires of Afghanistan.